Midway through my Junior year of high school, my secondary school counselor sat me down for the first time in her office. We talked casually about my future plans, she signed me up for the standardized test to be proctored in the school library at the end of spring break, and she showed me the filing cabinet with the collection of the school’s paper applications. I leafed through the files — Western Michigan University, Spring Arbor College, Alma College, Michigan State University, and the University of Michigan were all schools that I had seen materials from in my own mailbox. I left her office and returned only one more time before the end of my Senior year. To be honest, I wasn’t sure what my counselor did. I was a fairly good student who didn’t get into trouble, so I never had reason to visit my school administration’s office. My school was a small public school by comparison — around 450 total students grades 9-12 — and there were two counselors in the office. I was sure that they worked on schedules and may be met with students who needed additional guidance. They were both lovely, kind, nurturing human beings who had every student’s best interest at heart. I firmly believe that my counselor’s job was something valued by my school and a substantial collection of its students. Many students walked out of her office in better shape than when they entered. Her ability to connect to students was significant, and for some, that was exactly what they needed: A welcoming, warm face who was looking out for them. Many graduate schools continue to offer Master in School Counseling degrees, and dedicated professionals continue to pursue these degrees. A quick glance at a sample core curriculum reveals courses in family counseling, intervention, assessment, and human development. This course work provides a foundation that focuses on the micro and meso structures key to the functioning of a student in a school setting. But, much of this micro and meso structure support has been delegated away from the school counselor’s caseload. Instead, it is either (a) pushed to teachers to tackle in their day-to-day lessons and units, or (b) simply removed from the school environment altogether. This places a heavy burden on teachers to address issues such as identity, peer-to-peer conflict, and family dynamics. While many teacher prep programs deal with some of these topics, teacher’s jobs are — first and foremost — to teach. The shifting of this work onto their caseloads is an unfair and undue burden. In my first few months as an independent school College Counselor, I attended a summer training institute. The faculty of the institute were school counselors, college admissions folks, and college counselors from around the region. Sitting in a session about workload balance, a counselor spoke at length about the scope of her job. Located at a public school in Western Pennsylvania, she had a caseload of 350+ students, and around 80% of her work week was spent troubleshooting scheduling issues… all year long. I sat with my mouth agape thinking about what this would mean in terms of hours. In the 1,600 hours of her academic calendar work, she would spend 1,200+ of those hours on schedules. What I’ve come to realize is that this situation is not uncommon. I meet countless professionals who are tasked with dealing with schedules, often which consumes most of their work. Scheduling is an important part of managing student academics, and a careful hand must be placed at the helm of this management, I find very little in a school counselor’s training that suggests this task is what their degree is designed to prepare them for. I often joke with my family when they ask what I do and I say that I am a College Counselor. I find myself saying that I help students find their best-fit postsecondary options and that my office is a “no issues, no tissues” space. Of course, students come to my office with a host of questions, most of which only somewhat relate to college things, so this glib statement is not entirely true. What is true, however, is that my prime directive is college process oriented. I am in charge of helping students navigate preparation for college, while promoting a college-going culture in my school. This directive is not exactly in line with a traditional school counselor’s job. In fact, when looking back at the core curriculum for a Master in School Counseling degree, this becomes quite apparent. School counselors are prepared to meet all the more complex needs of students, with only a bit of college process oriented training. Yet, more and more offices are moving toward this college first model, leaving the “issues and tissues” to teachers and other entities in the students’ lives. Increasing amounts of offices are promoting themselves as college-going centers, reflecting the broader social trend that all students should be college bound. Though this approach is admirable in its focus, I often wonder what happens to the students who may or may not be bound for college. Are our secondary school offices still equipped to help these young folks forge a meaningful path? One group that has found more traction in school guidance offices is school psychologists. Part of this demand may be increasing requirements for testing students, managing student IEPs and other mandated documentation, and the promotion of Positive Behavior Support as the new wave to help deal with student issues. What is interesting about this move is that it’s a slight pivot in who addresses issues with students, but a substantial pivot in philosophy. Psychologist and counselor training is quite different, and many psychologists bring a different skillset to their work with students. In any case, the increase in psychologists has generally coincided with a decrease in school counselors, or a shift in counselor duties more toward the college process or to deal with schedule/administrative duties. The perception of having more doctors in schools seems to be positive amongst parents and politicians. Realistically though, I wonder if psychologists on their own are the right group of professionals for the job of holistically supporting students through their school experiences. 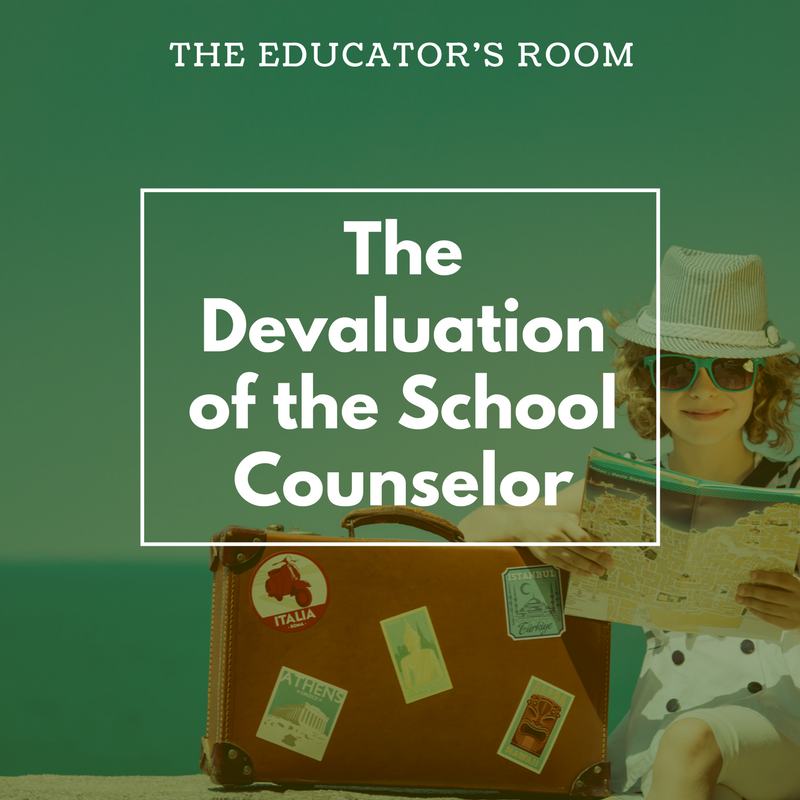 A case study of the devaluation of school counselors comes at the hands of the School District of Philadelphia. In 2013, amidst a crushing budget cut and a shortfall of hundreds of millions of dollars of operational money, the district decided to lay off 4,000 of its teachers and support staff. This included ALL 270 school counselors across the entire district. Eventually, 126 of these counselors were hired back by the district and allocated with caseloads of between 600 and 1500 students each. In addition to be wrought with many big-district issues, Philly school system is a microcosm of the devaluation of the school counselor: A district seeing an entire group of professionals as expendable enough to (almost) eliminate their role entirely.